A physician's certificate of age for Joseph Shaheen, confirming his date of birth as July 15, 1900. 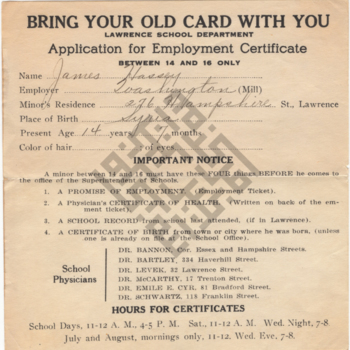 An application for an employment certificate for James Kalil to work at the Pacific Mills. It lists his residence as 68 Hampshire St., place of birth as Syria, and present age as 15 years, 11 months. An application for an employment certificate for Effie Jawdy, requesting to work at Prospect Mills as a doffer. It lists Effie's residence as284 Chestnut St., place of birth as Syria, present age as 14, and last grade attended as 7. An application for employment certificate forJames Hassey for employment at Washington Mills. It lists his residence as 276 Hampshire St, place of birth as Syria, and present age as 14. A letter, written by Priest Youseff Semaan on November 3, 1911, certifying Regina Dawood's baptism as October 30, 1896. This letter, signed by Rev. Namtallah in Syria on April 25, 1910, certifies Shafika Anton's birthdate as April 3, 1896 and her baptism as April 25, 1896 in Syria.